This premier career and college apprenticeship program is uniquely designed to advance college and career success for young adults with autism spectrum disorders, learning differences and medical impairments. The Transitions curriculum focuses on building academic, employment, life and general independence skills. At Transitions, your child will be safe, well cared for and will come out of the program prepared for opportunities that life offers beyond high school including college, a career and living independently. - Shaloni Winston, founder, Transitions. Lexington, Chapter of NYSARC, Inc. and The Arc, has announced “Transitions,” a supportive Apprenticeship program for high school graduates and young adults with learning differences including Asperger’s syndrome, ADHD, dyslexia, nonverbal learning disabilities, visual or hearing impairments and other medical conditions who want to attend college and/or prepare for a career but may require academic, social, medical and/or emotional support. The Transitions program’s curriculum focuses on building academic, employment, life and general independence skills. Through evidence-based approaches and services and a careful partnership with Lexington, a provider with over 60 years of award-winning disability services, Transitions students will have access to state-of-the-art facilities, an experienced staff including mentors and coaches, and a uniquely designed curriculum that will provide individualized attention and training in skills students will use for the rest of their lives. They will be trained in executive functioning, self-advocacy, safety, healthy living and wellness, as well as learn social skills and set goals, putting them on the path toward college and career success, and ultimately independence. Transitions will be located in Gloversville, NY, in the foothills of the beautiful Adirondack Mountains, and will share space with The Lexington Foundation’s Paul Nigra Center for Creative Arts, a year-round arts center that will provide a rich assortment of art and hobby-related classes for artists of all ages and interests. These new programs will be hosted in state-of-the-art buildings, which were recently purchased and are currently undergoing renovations to accommodate the particular needs of both Transitions and the Paul Nigra Center for Creative Arts. Transitions has collaborated with several elite institutions including the Savannah College of Art and Design, University of Washington’s DO-IT program for students with disabilities, Mayo Clinic, Virginia Commonwealth University’s Autism Center for Excellence and the Paul Nigra Center for Creative Arts to provide an exclusive experience for students who are interested in successful career and life outcomes. Transitions also offers many socially rich recreation opportunities, such as memorable Adirondack experiences, trips and entertainment. Both full-year College Apprenticeship programs and Career Apprenticeship programs are offered by Transitions. Applications are now being accepted for these full-year sessions, which start in August 2015. Additionally, Transitions is offering a three-week Summer Immersion Experience that will introduce attendees to the Transitions curriculum and college or life experience. Summer sessions are available from June 14–July 3, July 5–July 24 and July 26–August 14, 2015, with applications currently being accepted. For more information, call (518) 775-5374 or visit Transitions online at http://www.TransitionsUSA.org. Lexington, Chapter of NYSARC, Inc. and The Arc, is a private, not-for-profit agency that provides a wide range of services to adults and children who are disabled in Fulton and Albany Counties. Created in 1953 by a group of concerned parents, Lexington is recognized as one of the leading agencies of its kind in New York State. 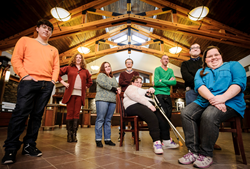 Accredited by the Council on Quality and Leadership and recognized as the #1 employer in the capital region of New York State, Lexington services over 1,000 individuals with intellectual and developmental disabilities. Visit Lexington online at http://www.lexingtoncenter.org. Millennium Business Communications is one of the capital region’s premier, full service marketing communication firms offering a full array of marketing, advertising, web development and online marketing, public relations, mobile marketing, business consulting, video and event production services. Millennium has won several national and industry awards for its Video, Television, Web and Print Media production, including Communicator and NORI Awards. Millennium launched Binary Communications in 2011, a division focused exclusively on mobile marketing solutions. Visit Millennium at http://www.millenniumbc.net for more information. Transitions - Advancing College and Career SuccessTransitions is a premier apprenticeship program uniquely designed to advance college and career success for young adults with autism spectrum disorders, learning differences and medical impairments.